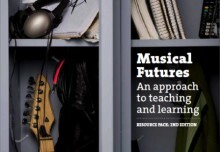 This workshop looks at some of the practicalities and skills required to introduce or develop Musical Futures in your school through the approaches and foundation units of Musical Futures Informal Learning, Classroom Workshopping, Find Your Voice & Just Play. 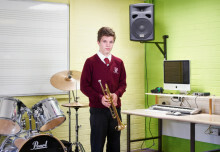 Informal Learning – explore how student motivation, enjoyment and skill-acquisition are enhanced in music lessons by tapping into the real-life learning practices of popular musicians. Classroom Workshopping – develop the skills to lead creative group composition to make music learning as practical an activity as possible. 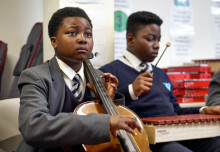 Just Play – find out about how to engage students in whole class music making by experiencing this simple step by step resource that supports the development of instrumental skills on drums, guitar, bass, keyboard and ukulele, using music that students like, enjoy and identify with. This is a hands on, practical, musical day led by a practitioner who has used Musical Futures in the classroom. 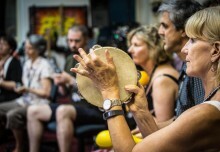 You will experience Musical Futures from the viewpoint of your learners and participate in taster sessions for Musical Futures approaches – informal learning, classroom workshopping, Find Your Voice and Just Play. We want you to ensure that you will leave with ideas and resources you can use straight away feeling confident that you can use them effectively with your students!